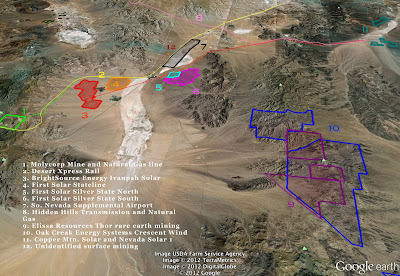 In a rather strong and thorough letter, the US Fish and Wildlife Service (FWS) in November asked the Bureau of Land Management (BLM) to reject First Solar's Silver State South solar project in the Ivanpah Valley, reiterating FWS concerns that the project will reduce or eliminate a critical linkage for the threatened desert tortoise. FWS' letter preceded a joint letter submitted in December by eight different environmental groups asking the BLM to suspend approval of any additional projects in the Ivanpah Valley until a conservation plan is in place, indicating that BLM decisions impacting the Ivanpah Valley so far have underestimated its biological importance. The California Native Plant Society (CNPS) routinely sponsors field trips in the desert and nearby mountains, know as a "rare plant treasure hunt," checking out local plant populations and looking for some of the rarest plants in our regions. Intrepid plant enthusiasts earlier this year hiked far into the craggy mountains near Death Valley in search of the rare Panamint Daisy (they found it! ), while others scouted out the San Gabriel Mountans and the Mojave National Preserve in search of special blooms. It's a great way to enjoy desert wildlands and learn more about the ecosystem. The Bristlecone and Creosote Ring Chapters in Southern California have a few more trips planned, and you can check those out at their chapter websites here and here.